In celebration of World Refugee Day on June 20th, 2016, Safe Passage Project organized three panels of speakers addressing access to justice and children seeking protection. Professor Lenni Benson opened the program noting the importance of the international and U.S. protections for refugees. While the world’s refugee coverage is focused on Europe, the United States is grappling with its own refugee crisis at our Southern border, including over 140,000 unaccompanied minors that have arrived the past three years from the Northern Triangle countries of El Salvador, Guatemala, and Honduras. With over 64,000 active cases, the New York Immigration Court is our country’s largest, and approximately 19% of New York’s docket is juveniles. Pictured above are our panelists, and Professor Benson holding Governor Cuomo’s proclamation declaring June 2016 Immigrant Heritage Month for the state of New York. 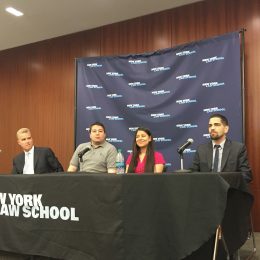 The first panel of speakers consisted of John Carter, a partner at Fragomen law firm, Danny Alicea, the Fragomen Fellow at the City Bar Justice Center, and one of Mr. Alicea’s clients “L”, a young woman from Honduras and recently granted asylum. With Fragomen, one of the largest international immigration law firms, John Carter emphasized their commitment and increase in pro bono services, particularly for unrepresented children. Mr. Carter discussed the necessity of proper legal representation to realize access to justice. As one of New York City’s leading asylum lawyers, Danny Alicea shined light on the legal obstacles for those seeking asylum, particularly the U.S. government’s prioritization of all recent arrivals for deportation. Additionally, lack of capacity at other organizations, lengthy forms, complex court procedures, and language barriers prove virtually insurmountable without proper legal representation for those seeking humanitarian protection. L, remarks interpreted by Safe Passage Project Justice AmeriCorp fellow Juan Carlos Chiquillo, outlined her journey of travelling from her native Honduras to the United States at the age of 20 with her four month old son. Poignantly, L described her fear at traveling to the United States and her relief to finally see the American flag: she knew she could be safe here. 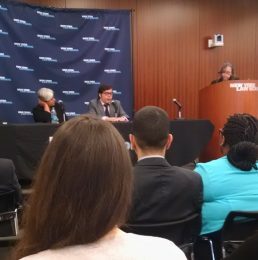 The second panel consisted of Jorge Montalvo, Deputy Secretary of State for New York, and Kavita Pawria-Sanchez, Assistant Commissioner of the Mayor’s Office of Immigrant Affairs. Jorge Montalvo discussed the New York state government’s role to protect and promote immigration. Particularly, Mr. Montalvo emphasized the regrowth of several upstate cities such as Buffalo and Syracuse due to refugee resettlement. Further, under Mr. Montalvo’s direction, the Secretary of State’s office has been able to open 27 Office for New Americans that help people with naturalization, DACA applications, and building businesses. Assistant Commissioner Kavita Pawria-Sanchez reported on the expanded efforts of the Mayor’s Office of Immigrant Affairs to integrate refugees and asylum seekers through city run programs that increase access to education, healthcare, and other city services. She explained that New York City serves as a model for other cities especially with the expanded outreach of ActionNYC and the municipal ID program. 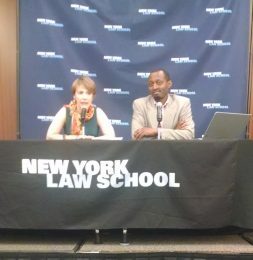 The third panel consisted of Claire Thomas, the Director of Training at Safe Passage Project and an adjunct professor at New York Law School, and her client Guy, who was recently granted asylum. Claire Thomas discussed her experience helping clients through the asylum process and some of the procedural hardships faced during the process. She illustrated that without the help of an attorney to secure basic rights, the promise of protection would be empty for her clients. Guy, who grew up surrounded by extreme violence, movingly spoke of the difficult decisions to leave his country after repeated threats due to his work as a journalist and political dissident. Even as a journalist and a person with a university education, Guy found applying for asylum alone extremely challenging and any computer research he might have done before leaving his country of origin could have put him at further risk of persecution from his government. Guy expressed gratitude to Ms. Thomas for helping him successfully secure asylum which, in the end, took nearly 3 years. Professor Benson ended the program with an announcement of the release of a report, U.S. Protection of Immigrant Children: A system in Need of Improvement. Read more here. To view the Panels, go here. Mr. Carter was named the Outstanding Pro Bono Partner by his colleagues for his continued work at the New York immigration court with the Safe Passage Project. Client biographical information has been withheld or changed for their protection.